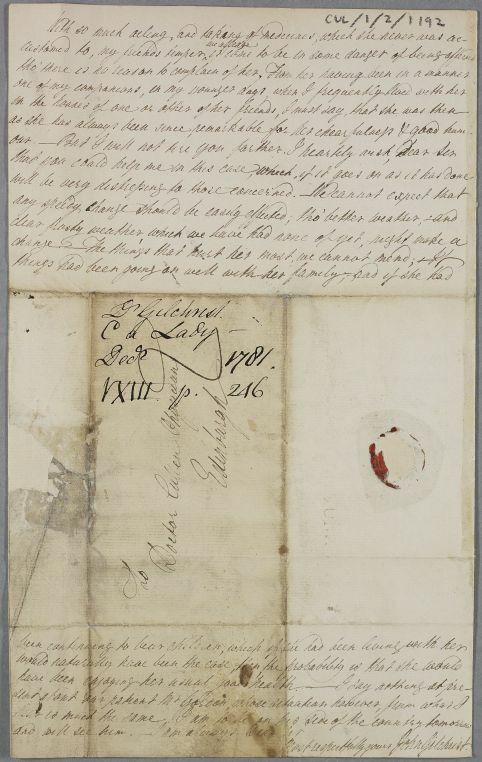 Letter from Dr John Gilchrist, concerning the case of an unnamed female patient with a prolapse and other serious disorders. 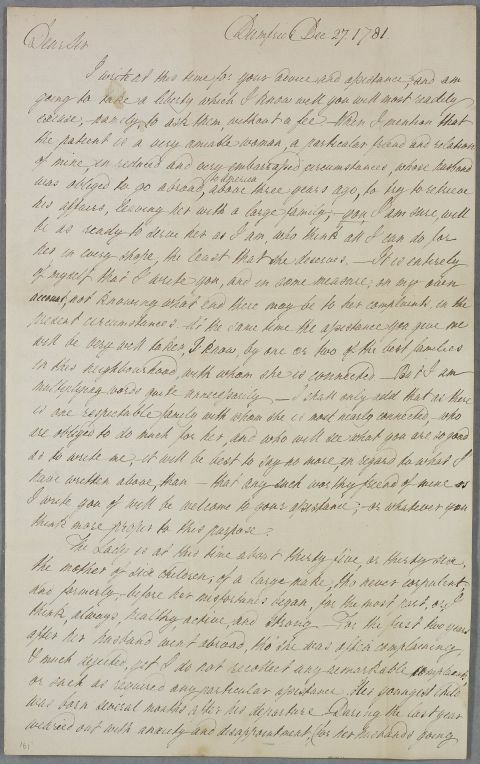 He requests that Cullen waive his fee, as the patient is 'a particular friend and relation of mine, in reduced and very embarrassed circumstances, whose husband was obliged to go abroad to America above three years ago, to try to retrieve his affairs, leaving her with a large family'. Also makes brief reference to another patient, Mr Gordon, who is described as being 'much the same'. Assumed to be Gilbert Gordon (ID168) because of location, timing and connection to Gilchrist. Summary Letter from Dr John Gilchrist, concerning the case of an unnamed female patient with a prolapse and other serious disorders. 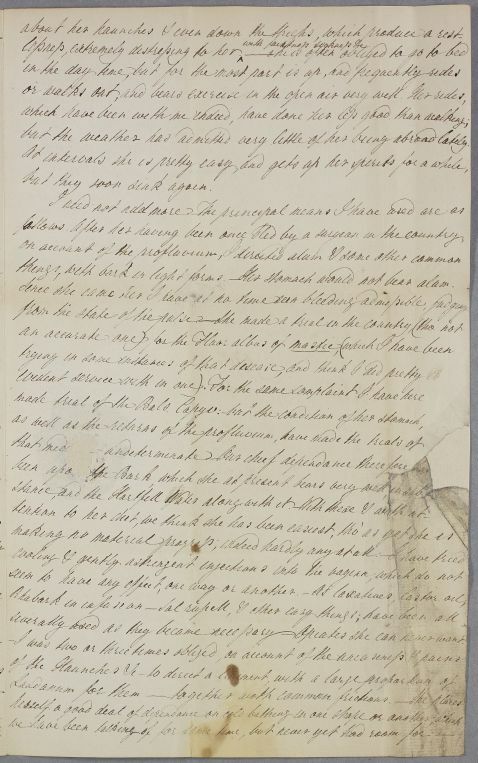 He requests that Cullen waive his fee, as the patient is 'a particular friend and relation of mine, in reduced and very embarrassed circumstances, whose husband was obliged to go abroad to America above three years ago, to try to retrieve his affairs, leaving her with a large family'. Also makes brief reference to another patient, Mr Gordon, who is described as being 'much the same'. Assumed to be Gilbert Gordon (ID168) because of location, timing and connection to Gilchrist. Case of Mr Gordon, who obtains an electrical machine to treat the pain and weakness in his lower back and stomach region, a condition considered almost paralytic by his local physician Dr John Gilchrist. 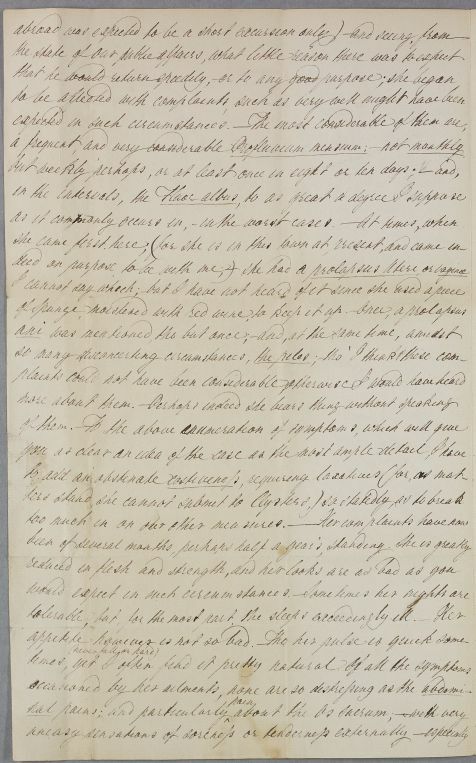 Case of an unnamed female patient with menstrual and uterine problems which are thought to be affecting he mental state; a friend and poor relation of Dr John Gilchrist at Dumfries. think more proper to this purpose. but the weather had admitted very little of her being abroad lately. but they soon sink again. things, with bark in light forms - Her stomach would not bear alum. severally used as they became necessary - Opiates she can never want. 1: Gilchrist is presumably alluding to the continuing war between Britain and revolutionary America.